Whether people want to acknowledge that Crytek is in some kind of dire trouble or not, it's quite apparent that a lot of the top staff that makes a game tick during its development process are no longer working with the company. 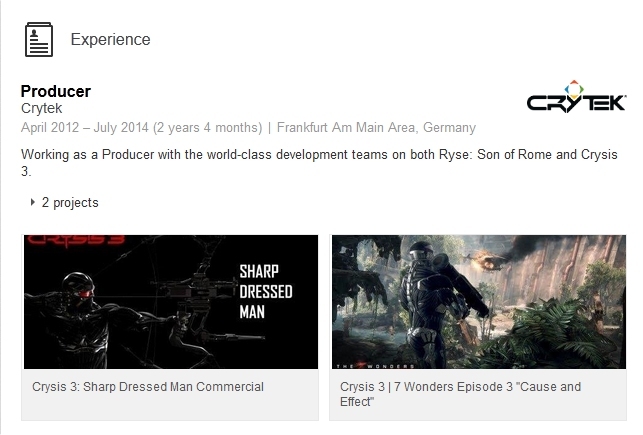 According to DSO Gaming, Mike Read the former producer of the Xbox One exclusive, Ryse as well as Crytek's high-end first-person shooter Crysis 3, has left his post at Crytek, the Frankfurt, Germany based software development studio. The info was spotted on Read's LinkedIn page, which caused quite a few people to pepper the producer about move over on Twitter. You can check out a snapshot of his LinkedIn page that shows exactly what's getting people to question what's really going on at Crytek (for those of you without LinkedIn accounts). Read is just one of many other faces that were part of the exodus of Crytek recently, with Crytek's graphics engineer for the CryEngine, Tiago Sousa, having also departed the company to go and work on id Software's new id Tech 6 and the upcoming new-gen version of Doom. Previously, it was reported that the game director for the upcoming open-world, first-person shooter Homefront: The Revolution had also left Crytek, leaving them without someone to lead the general production of the game and causing many to fear that this could become a troubled development cycle for the game, leading to the inevitable calls of vaporware and “development hell”. Of course, Crytek has not yet commented on the many reports that indicate that many of their top staff are leaving the company due to not having received proper pay since the spring. At the time of the original article at a German gaming site indicating that Crytek was unable to pay staff, the company simply stated that the game site was reporting a rumor and that it was not true. However, the reports about both Crytek UK and the Frankfurt main office running out of funds while their staff migrate elsewhere continues to escalate, and this most recent issue with Mike Read seems very evident of that. It definitely puts a damper on the potential future of Homefront: The Revolution. Of course, we won't know for sure exactly how bad the issue is with Crytek until they make an official announcement about the issue.